I am a US citizen filing for a CR1 visa for my spouse in India. I believe the form I need to complete is I-864EZ but can someone please confirm? Also - do I need to file jointly if I make $70000 annually before taxes? u have no timeline so when did you marry? My apologies. We got married last year. I wasn't referring to filing taxes but instead the AOS form. There is I864, I864W, I864EZ, etc. Is I864EZ the correct one for my case? Regarding taxes since you brought up filing. How does one go about getting an ITIN number for their spouse? How do I go about filling this out? I cannot enter anything in the 1.a., 1.e., 1.f. fields. I am filing for my spouse using the Chrome browser. 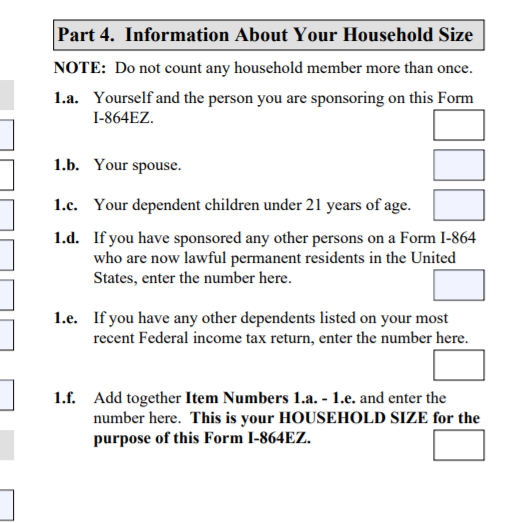 Read the I-864EZ instructions to find out whether or not you qualify for using that form. You are never required to file taxes jointly unless you wish to do so. You are, however, required to file taxes as married, whether that's married filing jointly or married filing separately. If you want to file jointly, you and your spouse can file a W-7 to the IRS to request an ITIN for your spouse. It can take up to 8-10 weeks but it will allow you to file electronically, I believe. If you choose to file separately, you'll need to paper file by mail with "NRA" written where your spouse's SSN would usually go.